Bible prophecy clearly reveals that immediately prior to the rapture of the Church, four powerful kings will race onto the stage of world history. Pastor Hagee reveals who they are, where they come from, and what they signify. Learn why Hagee believes that we are in the beginning stages of World War III, and how this will eventually take us to the Battle of Armageddon. Pastor Hagee vividly describes the key players that signify the King is coming! 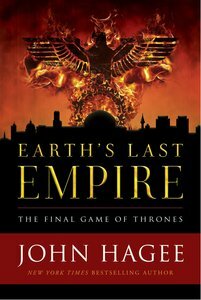 About "Earth's Last Empire: The Final Game of Thrones"
Dr. John C. Hagee is the founder and pastor of the 17,000-member Cornerstone Church in San Antonio, Texas. Dr. Hagee is also the President and C.E.O. of Global Evangelism Television which telecasts his national radio and television ministry on 120 TV stations, 110 radio stations, three networks and can be seen weekly in over 92 million homes. He is the author of several CBA bestsellers including HIS GLORY REVEALED, FROM DANIEL TO DOOMSDAY, GOD'S TWO-MINUTE WARNING, and THE REVELATION OF TRUTH.